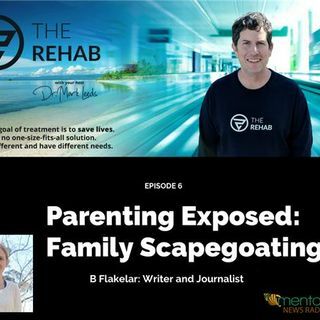 My guest on this episode of The Rehab is B. Flakelar, journalist and writer. B. is a victim of narcissistic parenting. Through many years of therapy, study and research, she has developed a model of the family controlled by a narcissistic parent that has resonated with a great many of her readers. While reading her work, I was surprised by how accurately she described the stories told by many of my addiction treatment patients. I wondered about the possibility of some people with substance use ... See More disorder having difficulties in recovering because of non-physical abuse from their own families. I also considered the possibility of addiction itself being triggered by such a malignant family structure. I was curious to learn more from B. about her understanding of this family condition and the relationship it may have to addiction as a cause and roadblock to recovery. This episode reveals her incredible understanding of narcissistic abuse as it relates to addiction on a personal level and with respect to her research on the subject.